Someone once said that there is no place on Earth that beats the Greek islands, for their simple beauty and the ability they have to inculcate in visitors a sense of deep happiness and escapism. The smaller islands are only reachable by boat, which is a particularly delicious way of arriving. Jemima went for a week to Paxos with a group of friends, her husband Ben and babies recently- how unspoilt and special it all felt, the adventure of reaching the island by boat in the luminous aqua clear water in the late evening sunshine was simply magical- the creative genius of all the infamous Greek literature really strikes a cord. The scent of the pines and cypresses reaches you long before you make landfall, followed by the hypnotic song of countless ciccadas. Closer in you see rough-cut small fields enclosed by tumbledown stone walls in which grow the most valuable tree found in these islands, the olive. Some are thousands of years old, stout and huge and misshapen, making the hypnotic ancient Greek dream come alive. The disappearance of goats from many of these islands in recent years has allowed nature to recover significantly, and previously overgrazed hillsides are now bursting with life for the first time in centuries. Olives, tomatoes, capers, goat’s cheese. These are the main things produced on the Greek islands. And of course, a huge array of seafood – fished from seas which, sadly, have been heavily depleted by overfishing. A common criticism of Greek food is that it is repetitive. But these simple ingredients are of just such perfect quality, so utterly delicious, that you’re never disappointed by the staple lunch. How does it always taste so good each time, but to replicate it back home never is as pleasing. Produce is full and ripe, warmed by the sun and rich in flavour- doused in plenty of olive oil to me mobbed by warm bread. A morning exploring the island, on foot and by boat- sun baking upon your salty body craves a bountiful spread. 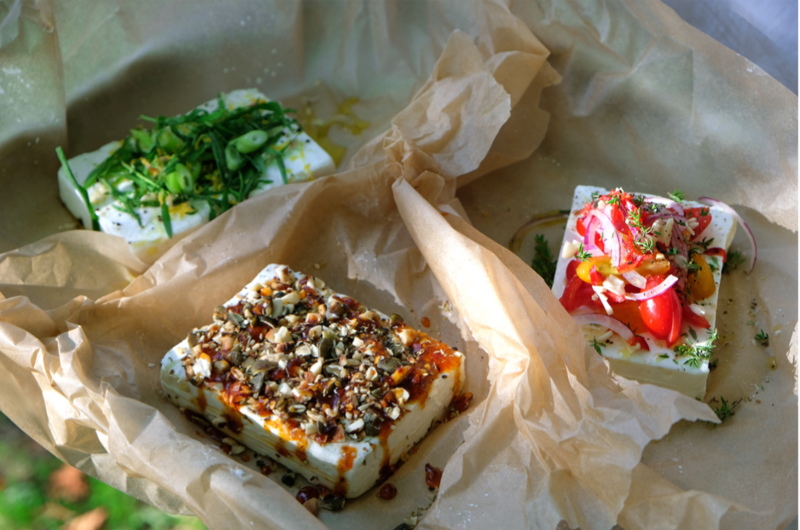 This time was the first time ordering this fantastic bubbly baked feta, which arrives parcelled up in tin foil hot off the bbq to be opened to display a mouth watering feta with tomatoes, onions and if you’re lucky chilli. This was a revelation to us- so simple and easy, but the perfect accomplishment for all the salads and dips. You get that naughty deserved side, but without any heaviness. We have come up with three recipes, one keeping it classic with the tomatoe style- adding lemon zest, garlic and thyme, and the others getting a little more inventive- one with a mixed seed, spice and nut with a saffron honey and the other fresh with lots of tarragon and lemon. We have now been making it back home- to go alongside the Sunday roast, think slow cooked lamb with grilled vegetables and herby rice with yoghurt. Or maybe something to be pulled out of the oven as friends arrive for drinks- served with torn up pieces of sour dough and olive oil. Small handful of cherry tomatoes- thinly sliced. in a small sauce pan heat your honey over a medium heat, add the pinch saffron, paprika and dried chilli. Allow to infuse and then take off the heat. generously add leaves of tarragon to your feta, followed by the sliced garlic, lemon zest and a little squeeze of lemon. Drizzle in olive oil and season. Place in the oven 10-15 minutes. Preheat oven to 200*. In either tin foil or baking paper, get a big piece and place your feta in the centre- with enough space to fold up the sides. If using tinfoil you can just pinch the sides together to close. If paper then use kitchen string to tie it together.